Sometimes a list is not appropriate for a Project or a Notes/ABC File page. It might be too active and need space on the weekly spread. Or it might be too short. *owed (things owed to me or from me to others; should be taken care of over the next few weeks). These lists are written on post-it notes. Each moves to my weekly spread if and when I will be dealing with it. For example, the day that my timesheet is actually due (noted on my weekly spread), the sticky note with the times will move to the weekly spread. When I am going to see my relative who is selling donuts for a fundraiser, I'll move the "owed" list to that day to remember to pay her. Therefore, I just need a resting point for these lists where they are easily accessible, but not with my more complex projects or my notes (because they are quite active). These temporary lists, as seen above, are stored right behind my post-it sticky note dashboard. The plastic card is perfect for holding sticky notes. Entries about the lists (like "Timesheet Due Thursday" or "Mom's Birthday - buy gift" with the "buy gift" scratched out because my sister bought it) go on the weekly pages. So far, this little hack is working perfectly. I'm thinking about putting menu here, too, instead of in my critical, limited weekly space. 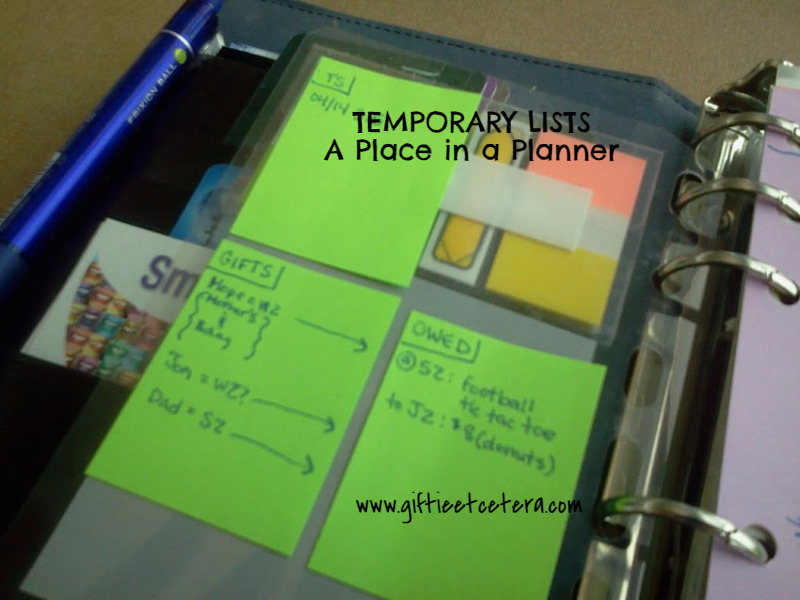 Let me know if you have any other ideas for temporary lists! I like your "too active" list idea. My "too active" list is the menu, which is my UN-forte. So, I use a page with the days blocked off, and sticky flags with the main dish written; I keep a parking lot page full of these flags, in my Projects section. The menu page is inserted between the applicable week pages and because the menu page is narrower than my FC Compact page, I get a visual that it applies to that week. The big benefit to me, is that it does not take up any valuable real estate on my "real" page. Now, to get the other "too Active" lists into place.